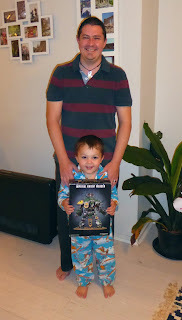 Marc has just sent me this picture of him holding the 40kaddict terrain competition prize. He's already started to discuss his plans for the beast on his blog - http://oldschoolg4m1ng.blogspot.co.uk so if you haven't already hop on over and check it out. Personally I think he should paint it in the colour of his son's PJs they're pretty dapper! Anyway, Marc will be doing an unboxing of the Knight, he's been after one for a long while so he's justifiably excited and I can't wait to see the crazy things he's got planned for it. A big thank you once again for all those that entered, voted and clicked on the adverts - you all made this competition happen and I look forward to doing some more in the future. Excellent! Can't wait to see how it turns out. Glad it arrived safe and sound after such a long trip. Hold that thought on the colour Dave, it may be very close to my son's PJ scheme (at least in parts) ;-) He was fascinated when I took it out of the packaging, we have both been flicking through Warhammer Visions 17 with the Wardens and Crusaders in there. "Wow... he's got big pew! ".